Depoe Bay is the only town on the entire coast that has a impressive sea wall running the length of the downtown area- which means you have an ocean view while shopping or dining! The waves here run beneath lava beds and spout water as high as 60 feet! A pod of grey whales have made Depoe Bay their permanent home, so residents and visitors can enjoy close up encounters with these gentle mammals year round. 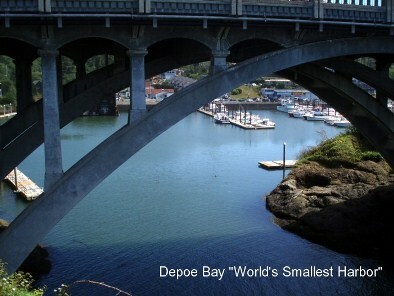 The harbor at Depoe Bay is the smallest natural, navigable harbor in the world and the coast guard launches from there – it is quite a sight watching the brave and skilled captains as they “shoot the hole” through white water, narrowly missing the bridge and rocks that frame the opening to the bay. Depoe Bay is in Lincoln County between Lincoln City & Depoe Bay. It is located on US 101 next to the Pacific Ocean. Check out the interactive map below and explore! Definitely check out the downtown as a seawall runs its entire length and whale come within a few feet of the wall making for frequent up close experiences with them. Lava beds run along the wall and water can spout up to 60 feet drenching more than a few unsuspecting visitiors! The world's smallest harbor is home to the US Coast Guard and several great activities like the Annual Crab Feed or Wooden Boat Show. Loads of restaurants but we are partial to Tidal Raves and the stunning views. Also, after dark we love Gracie's Sea Hag. Sit in the back bar around the fire pit and enjoy live entertainment on the weekends.